When you purchase something from our store, as part of the buying and selling process, we collect the personal information you give us such as your name, address, and email address. When you browse our store, we also automatically receive your computer’s internet protocol (IP) address in order to provide us with information that helps us learn about your browser and operating system. Email marketing (if applicable): We may send you emails about our store, new products, and other updates. Our store is hosted on Shopify Inc. They provide us with the online e-commerce platform that allows us to sell our products and services to you. Your data is stored in Shopify’s data storage, databases, and the general Shopify application. They store your data on a secure server behind a firewall. To protect your personal information, we take reasonable precautions and follow industry best practices to make sure it is not inappropriately lost, accessed, altered, or destroyed. If you provide us with your credit card information, the information is encrypted using secure socket layer technology (SSL) and stored with a AES-256 encryption. Although no method of transmission over the Internet or electronic storage is 100% secure, we follow all PCI-DSS requirements and implement additional generally accepted industry standards. Here is a list of cookies that we use. We’ve listed them here so you that you can choose if you want to opt-out of cookies or not. _session_id, unique token, sessional, Allows Shopify to store information about your session (referrer, landing page, etc. )._shopify_visit, no data held, Persistent for 30 minutes from the last visit, used by our website provider’s internal stats tracker to record the number of visits _shopify_uniq, no data held, expires midnight (relative to the visitor) of the next day, Counts the number of visits to a store by a single customer. cart, unique token, persistent for 2 weeks, Stores information about the contents of your cart. _secure_session_id, unique token, sessional storefront_digest, unique token, indefinite if the shop has a password, this is used to determine if the current visitor has access. PREF, persistent for a very short period, set by Google and tracks who visits the store and from where. We look forward to helping you on your journey to hair regrowth. Vitalize Hair 100% All Natural Hair Regrowth System is now available. 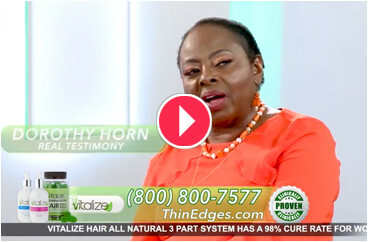 Copyright © 2018 THIN EDGES | Product of VITALIZE HAIR *INDIVIDUAL RESULTS MAY VARY. Our Staff is always here to help!